Checks shirts for mens looks versatile on wearing because it will always have new color combination. The size of checks also get differs in each one. Some may have small checks while some may have big checks. Check shirts are available for women too. A wardrobe of a man should contain check shirt design to avail the benefit of looking smart and casual at a time. Check shirt never go out of fashion. It has been worn by almost every man, be it a college guy, a businessman or a rock star. It always gives you an eye-catching look. In check shirt also you will find a variety of checks that you must have seen but still unknown about it. Check shirt displays your relaxed mood. The college teens and youngsters also prefer to wear checks short sleeve shirts over t-shirts to obtain a different stylish look for picnics, outings, night outs or even a regular wear during summers. 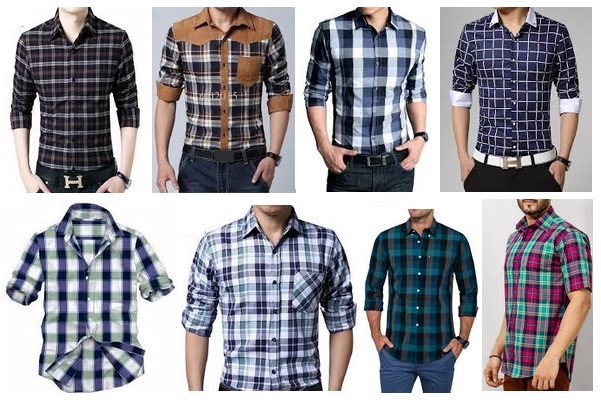 Here are few amazing check shirt prints which would surely increase your online shopping bills for a stunning appearance. This mini check design is known as Gingham check pattern. The check pattern is done with same color horizontal and vertical lining. It is crossing each other on a white background. 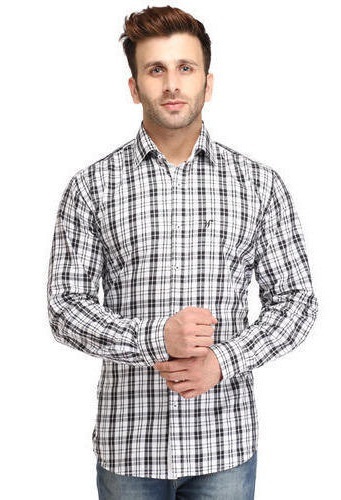 This Check shirt can be used both as formal and informal wear. Light pink color looks amazing. 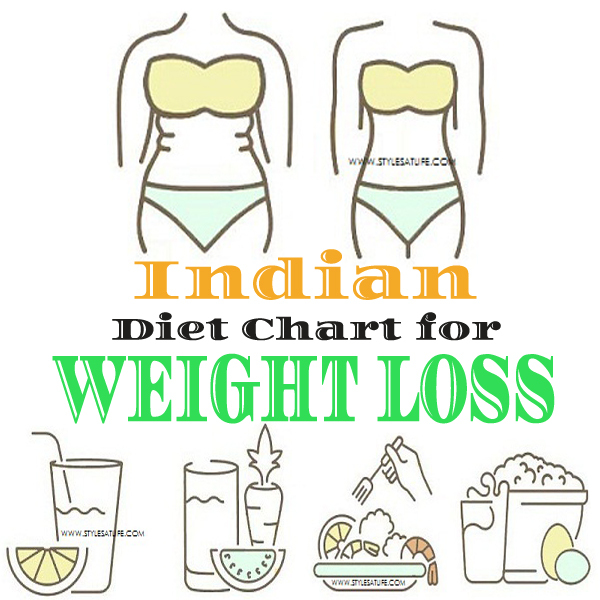 The minute checks are widely the choice of men who are little healthy as it gives a slimmer look to them due to its loose fitting. 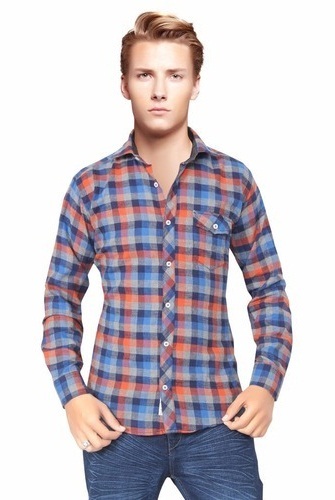 This madras checks shirt for mens is having fabric which suits best in summer. It is having colorful checks and strips. This check is made distinctive with other by forming strips of various colors and of uneven sizes. It is treated as a casual wear. This color combination looks vibrant. The design is inspired by the cotton shirts which are basically the prime design in South India cities to fight against heat. Tartan Plaid checks are somewhat similar to Madras checks. It is also having uneven sizes of checks by various stripes. One thing makes it different from Madras checks shirts for mens are that it is less colorful. It normally has two or three color tones. The shirt is given checks in black and white which is the widest selected colour piece for formal wear in offices.It has thin and thick lines of color. This pattern got Shepherd name because of the design worn by Shepherds in the Scottish hills. Though it looks like a Gingham checks shirts for men because of the strips crossing each other, but it is having a twill background. It is more adopted as a work wear. 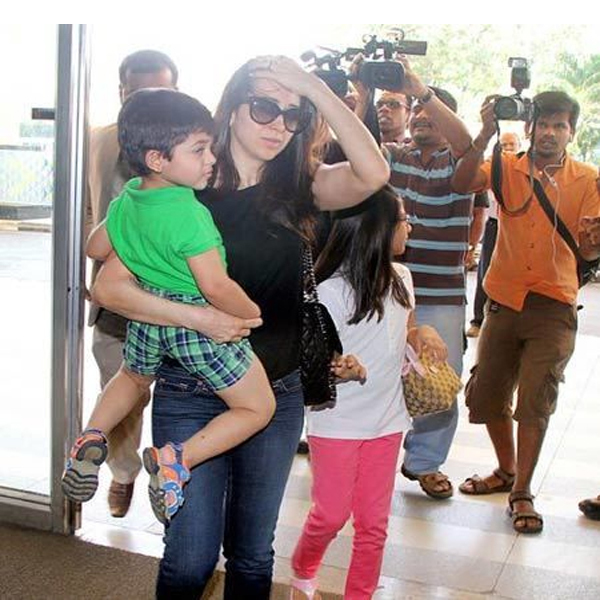 The shirt is officially carried over jeans giving a matching look with the blue tiny squares the shirt carries. A hounds tooth checks resembles checks of broken and pointed lines. This checks looks like a teeth. It is also known as dog tooth. Traditionally it was available in only black and white color, but now it comes in a variety of colors. 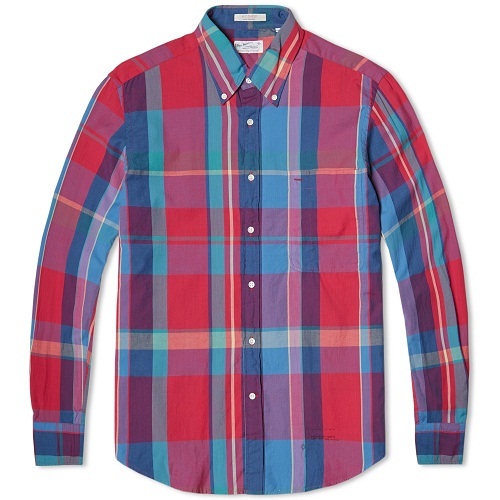 This is one of the best check shirts which gives a 3D look to the shirt leaving your eyes gloomy while getting a view. It is also widely accepted for corporate events or parties for a magical appearance to catch the visions of the female colleagues. Windowpane checks are simple in style. It consists of criss-cross stripes that forma large check. Typically the base color is white, with stripes of different colors. It reminds of the pattern of pane on a window. Such men’s check shirts make you look an executive person. The brunch collar shirt is perfect for offices or under a suit-coat wear for social and corporate events. There are also shirts available in this category which have plain white collars for giving a contrast look to the shirt. Such checks shirts resemble like a graph paper. This pattern consists of thin and single color linings forming small checks. It looks like a windowpane checks. In windowpane, there are big checks and in graph checks there are small checks. The design is the best selected by those who love to wear graphical patterns for a perfect formal look over casuals and formals. The design is also at some working places considered as a studious uniform pattern for the officers. Tatters all’s check is made up of straight and side lines that cross each other to give an even size checks. Sometimes there are three colors used to form stripes.Colors of stripes are thicker than background. Thick stripes are highlighting the power of check shirt design. The design contains several small and big checks in different colors. It is a design which is quite loved by the teens. This pin checks shirt pattern is created by pin sized stripes. It forms a tiny check which looks like a dot from a distance. The checks are so small that they look like a solid texture nearly invisible without a proper attention to the designs. Normally it consists of one color only. The check pattern of this shirt is of hypnotizing appearance. Though can be carried for formal, it is widely picked for casuals on jeans or creasy pants for a dude look. Mini checks shirts for mens are similar to Gingham but small in size. Unlike large checks, it possesses very small checks. These checks are of same sizes with two color tones. To add to its graceful appearance, the shirt is also given buttons which carry the same chess checks design in glass. It looks purely a professional one and sophisticated. This shirt will always require iron. Royal blue is favourite of man. This check shirt is in pure cotton material. It has three color tones. It looks like a brick of new colors are kept. Cotton is a comfortable fabric and apt for hot days. It is having checks of big size with thick stripes. The white strips are placed to bifurcate the checks squares giving a new look to the shirt. Tri-color combination is rocking this shirt. This is two color shade check shirt. It also has pockets on both sides. This is a light and dark color combination of checks with equal size. This equal size checks has peculiar quality of enhancing your personality with dark color shade. It is the best design which gives the colors grey and black a rich look for casuals for reception functions, pub parties and much more over jeans, boxers or trousers. 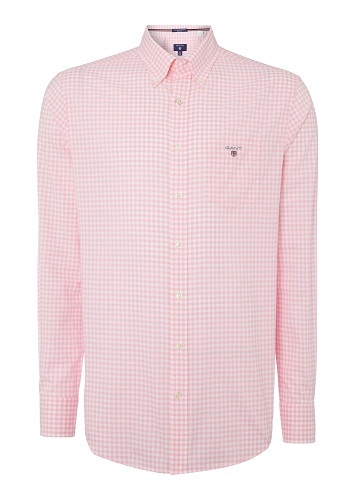 This checks shirt for mens is having a pleasing design. It is nice color checks with a t-shirt attached inside. It features a quiet friendly pattern. The dual pattern is much visible in colleges worn by the teens especially for vintage wear. The pattern is also popular for a day’s picnic and for tracking purpose too,this is a stylish check shirt and you can affix half sleeve t-shirt inside for cool look. This checks shirts for mens pattern is created in a stylish manner. Inside each check, nice pattern has been done with dark colors. It looks like a color is sprinkled with spray. This irregular shirt is slim fit with dark and thin stripes. A thin line defines the big square design. The sprinkle design in a colorful pattern is so sophisticate for jeans as they are short in length or over high waist trousers. This check shirt is having multi-color combination. This is highly informal shirt. Though the checks are of even sizes yet it looks like a 3D shirt. The colors are reflecting in eyes. Lining of colors are crossing each other and forming a check. The prime thing about this design is that it gives a flourishing look with any of the color you choose from a wide range to select for. Wearing a checked shirt with a tie, pant and leather shoes are perfect for an office look. If you don’t want to wear a tie, you can keep as it is also. When you match it with a jean, it will become a casual wear. For more informal look, you can also wear sleeveless jacket over shirt. One more way to rock with check shirt is of wearing undershirt and leaving the shirt unbuttoned. Check shirt is nothing but a modified stripes crossing each other and forming squares. Checks shirts for mens have arresting nature and looks radiant on wearer. The check pattern will add glow to your face.